Despite a misty and drizzly start, Saturday 1st December turned into a beautiful cold, clear day, perfect for wrapping up warm and joining the wonderfully varied throng in Mill Road for the annual Mill Road Winter Fair. This year saw the first ever labyrinth at the fair, and, as the day went on, it proved to be very popular with visitors of all ages, sizes and backgrounds. The idea for the labyrinth began on a summer day when I was passing Petersfield on my way to a meeting at Jimmy’s Night Shelter. I noticed the large green space… the benches round about… the encircling mature trees… I thought, how wonderful to make a labyrinth here, which could be walked by Jimmy’s guests and local residents alike, as a symbol of community. Afterwards I remembered the Winter Fair, which seemed the perfect opportunity to put my idea into practice. 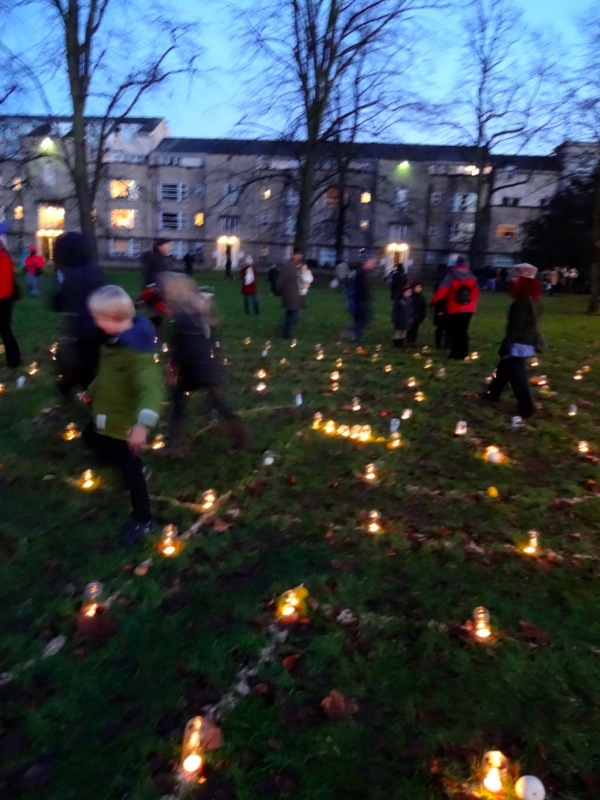 Mill Road Winter Fair committee liked the idea, especially the plan to light the labyrinth pathways with tea lights in jam jars. Jimmy’s and Cambridge Link Up were very pleased for me to raise awareness of their work through making the labyrinth. 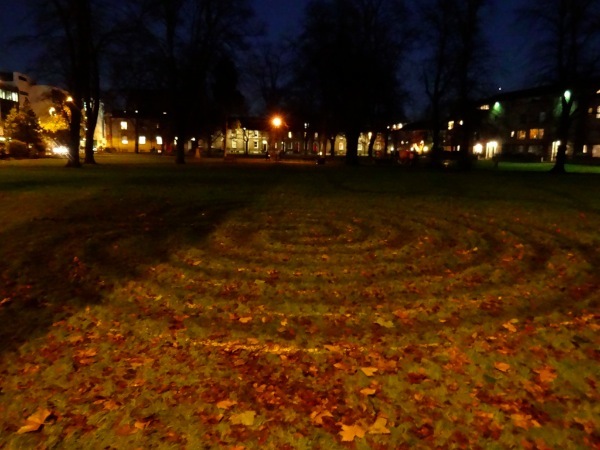 On the day the labyrinth looked truly magical as dusk descended. Gradually more and more people came to walk it. Quite a few were intrigued by the ancient pattern of its circuits and wanted to know more. Many clearly experienced the meditative quality of the labyrinth for themselves. Youngsters and small children were particularly drawn to it and had a great time racing round it. Darkness fell at 4.00pm, and soon after the arrival of wonderful local Samba Band Arco Iris announced the rousing grand finale of the Fair. 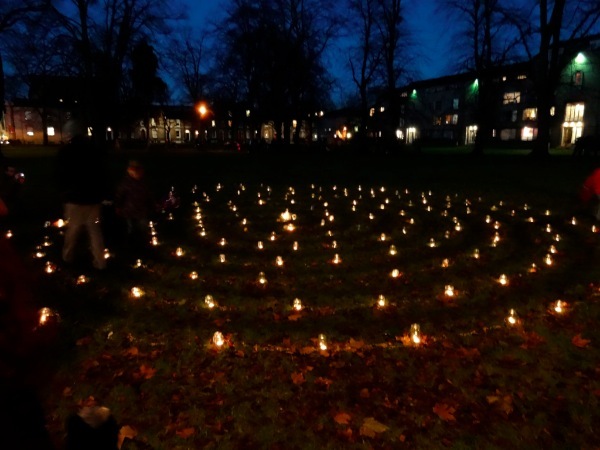 Many thanks to all those who helped make the labyrinth, also those who saved up their used jam jars and those who helped put them out and light them on the day. Thanks too to Paul Edwards who took these lovely photos. All being well, we’ll be back again next year! This entry was posted in Uncategorized and tagged Cambridge Link Up, candlelit, candles, jam jars, Jimmy's, labyrinth, Mill Road WInter Fair.